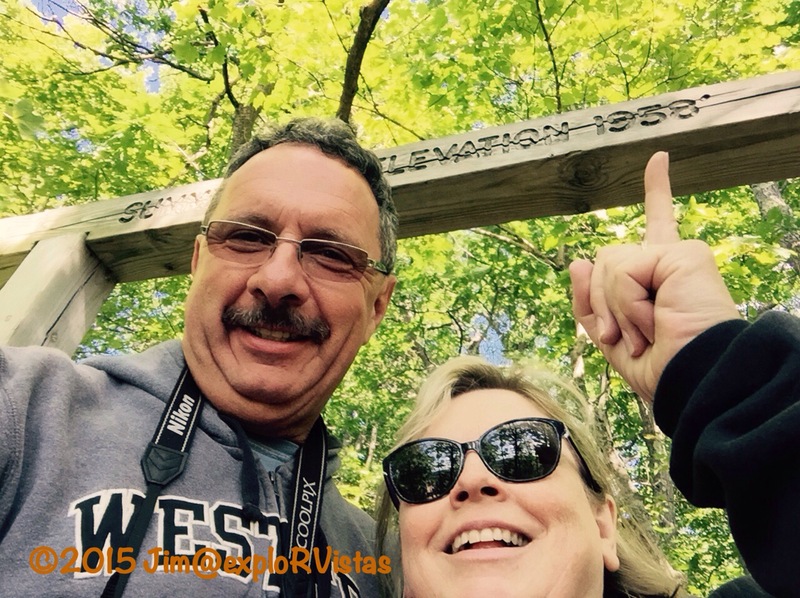 After exploring the Presque Isle River on Tuesday, we decide to check out Summit Peak on our way back to camp. The trail to the top of Summit Peak begins at a paved parking area at the end of Summit Peak Road. 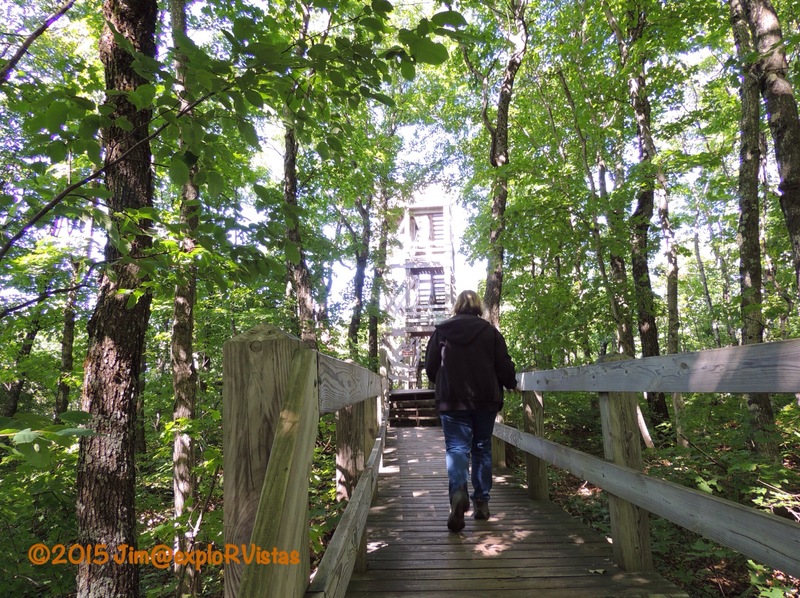 It is a fairly easy 1/2 mile climb through an old growth hardwood forest to the top via a gravel pathway, wooden boardwalk and stairs. Two thirds of the way up, we came to the Lake Superior Overlook. To offer some perspective, this photo is looking northwest. 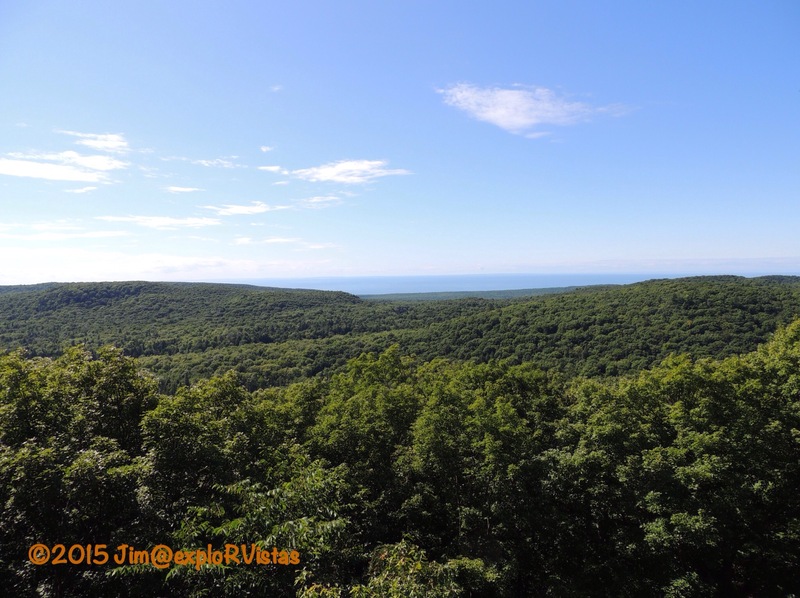 Lake of the Clouds and the Escarpment Overlook are hidden by the ridge a few miles away. Lake Superior can be seen in the distance. Heading back into the woods, we came to this sign. After climbing quite a few stairs, the tower came into view. With the tower being 40 feet high, the climber’s eye level ends up to be higher than 2000 feet above sea level. What a view! 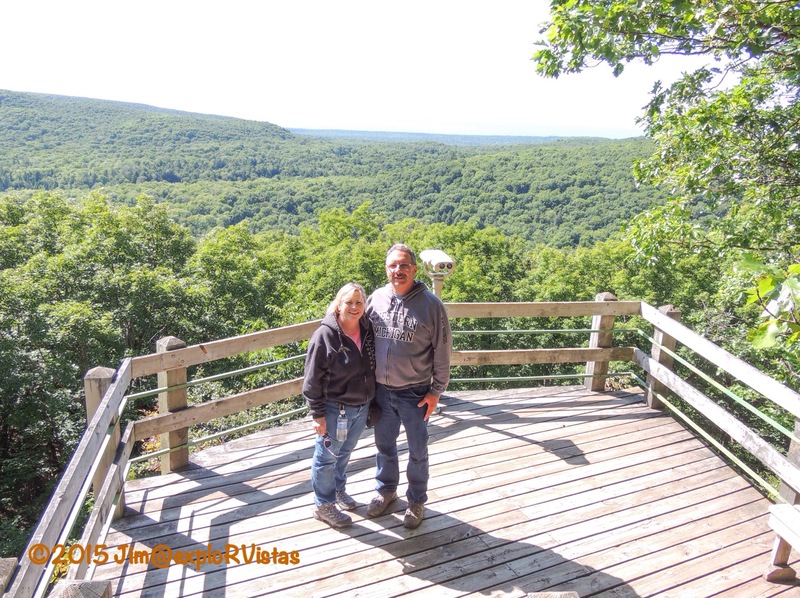 If you pull in the horizon on the above panorama, you can see Wisconsin’s Apostle Islands in the distance. Back towards the east are the Huron Mountains. Somewhere out there are Mt. Curwood and Mt. Arvon. Below us, we could see a preview of what is coming soon. 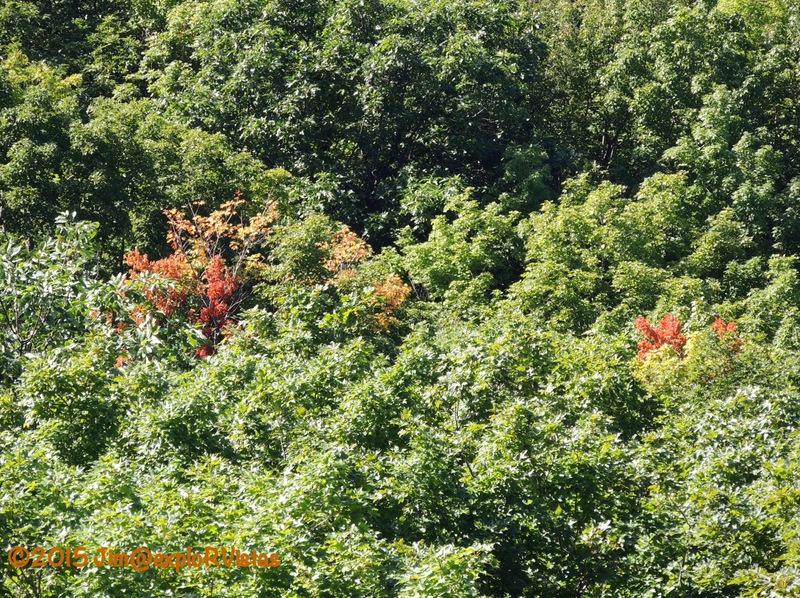 It won’t be long before the entire area is ablaze with fall colors! On the way back down, Diana spotted this beauty. This is Indian Pipe, known also as Corpse Plant of Ghost Plant. It lacks chlorophyll, therefore it has no color to it. With the forest being old growth, the floor was fairly wide open and easy to see across. That made it easy for us to not only see wildflowers, but to also keep an eye out for bears! 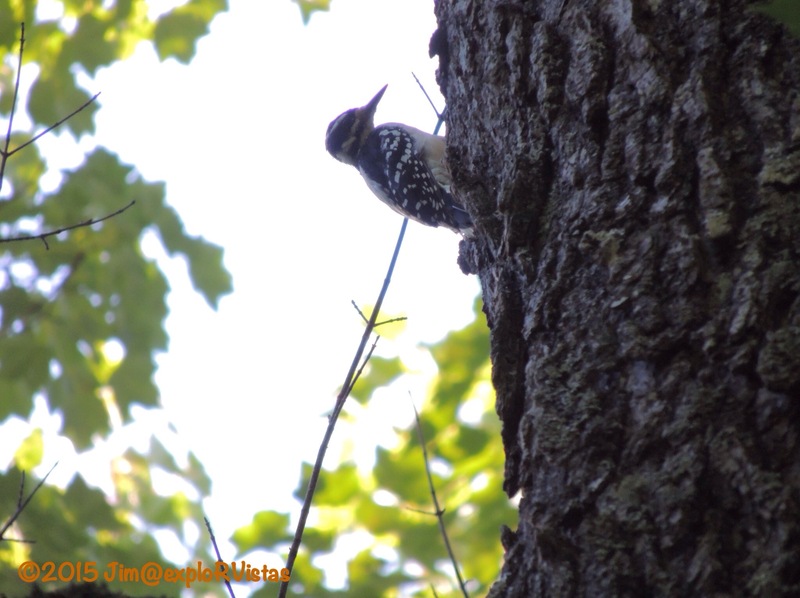 We also spotted this Downy Woodpecker working away on a tree. 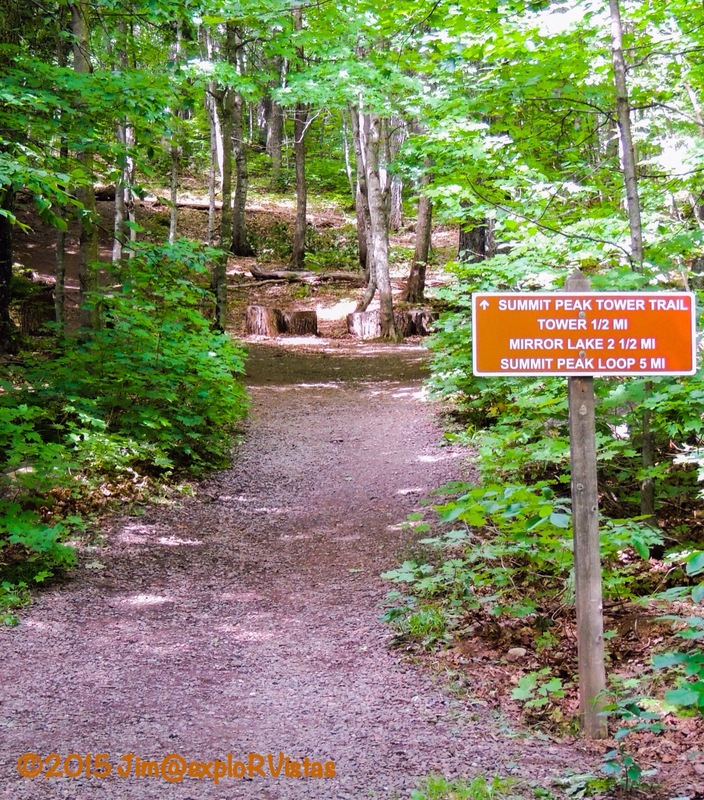 So while Summit Peak may not officially be the highest peak in Michigan, it’s tower does offer the highest mountaintop vista available in the state. Make sure to take the time to check it out if you are in the area! Looks like you’re having a great time! Rib Mtn is the WI claim to height supremacy and it doesn’t even deserve the name, should be Rib Mound! Is that when you guys were born? What a great day to climb that tower! You had a magnificent view out across the lake:) You have to get up high to get any view. Looks like a perfect day! 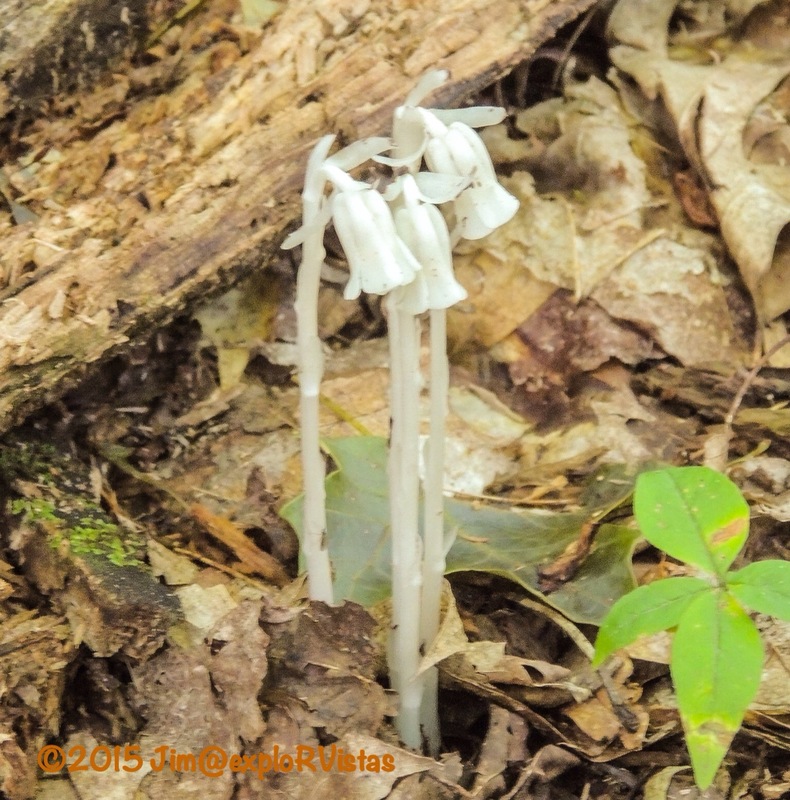 Love the Indian Pipe, very ghostly…haha! We’ve really lucked out on the weather, Pam! What a view during a sunny day ! 🙂 During autumn, it must be full of vibrant colours. and I can imagine the mushrooms growing everywhere. Must be delightful as well. We could easily get back there in a couple days with the 5th wheel, Gin. Lake Leelanau is not all that far away. Sounds like you are having a wonderful time. Thank you for the Travel log. It is fun to follow your adventure. Thanks, Bonnie! It is fun to share it. We love reading yours also! 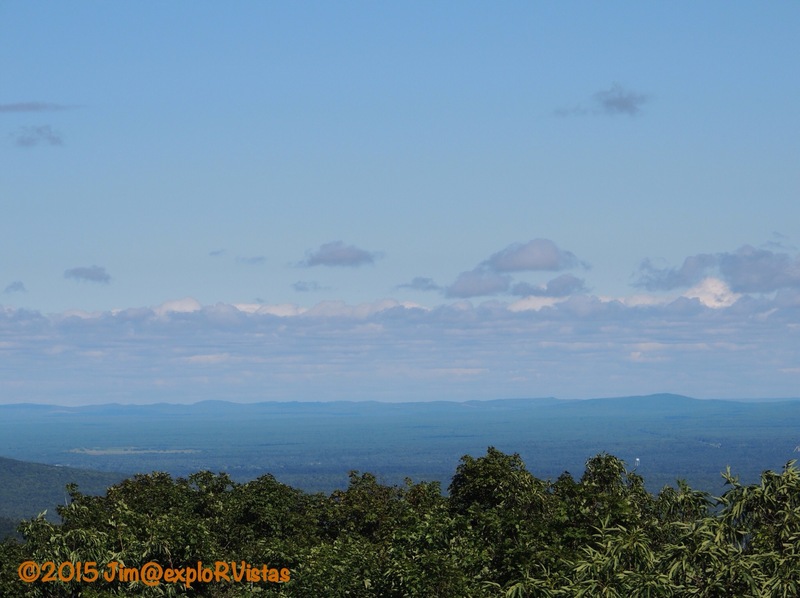 Great when you can find a hike with varying distances and a great viewpoint on the way. What a spectacular view! The entire area is full of trails. Lots of great opportunities! 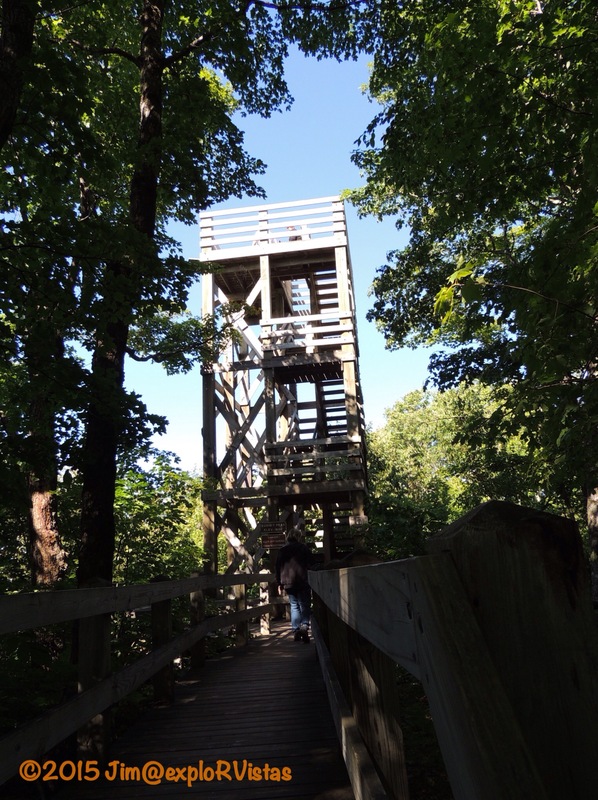 Love the lookout tower and the view! The corpse plant looks so delicate. I’ve never seen one. Nice to read your blog again. After Tetons/YS for a few weeks, I’m very behind on reading and posting! Thanks, Debbie! I enjoyed your FB posts!